Todays episode is with a man who has traveled the globe two times over chasing adventure and the experience. Mark Peterson is a Hunter, Conservationist, Producer, Outfitter, Guide, Consultant, TV, but most of all a father and a Husband to his family. We had a great conversation on a host of topics around hunting. Overall I really enjoyed chatting with Mark and think he is a great spokesman for hunting. Mark has set a life goal of completing a triple slam, one with each weapon, which is a big goal to accomplish but I look forward to watching his journey. “Growing up near Lake Michigan, in the rolling hills of Oceana County, I developed a love and passion for hunting and the great outdoors at an early age, fostered by my father, who was an avid wingshooter. Starting at age 4, I went wilderness camping with my father in 12” of snow during January. With only a candle for heat, I’d listen to hunting tales from around the world and dreamed that someday I would create stories of my own. For the past two decades, my hunts have continued in Michigan but also expanded to other areas around the world. In 2013, I completed my Grand Slam of North American sheep. This episode is brought to by Sportsman’s Box. Sportsman’s box is a monthly gear discovery box for hunters and anglers. Each month they bring you cool new gear, apparel, and even jerky or BBQ rubs . The box is focused on things hunters and anglers actually use and name brand gear too. Each month they send you between $65 and $80 dollars in gear and it only cost you between $35 and $39. That a ton of extra value! The Sportsman’s box makes a great gift too, its like the gift that keeps on giving every month. Signup for at www.sportsmansbox.comand get 20% with The Rich Outdoors Podcast codeTROand get 20% off. This Episode is brought to you by onXmaps. If you are a serious hunter onX is 100% a must have in todays hunting environment. I often ask on the podcast what the best piece of gear under 100 dollars is that makes them a better hunter and this is hand down on my list of gear under $100 dollars. onX maps is not only the most trusted public/private mapping system out there for all 50 States, but it also has all kinds of map layers. From hunting units, to road systems, to burns it has a ton of information. I don’t think I can stress enough how important it is these days to know where you are and where you can and can’t hunt. On top of all of that the onX app allows you save maps and use them when you are out of service. I actually just learned this out on my last bear hunt, but onX maps uses your phones GPS so it shows you exactly where you are even when your phone is on airplane mode. The best part is your onX maps sync between all your devices. So when you scout on the computer at home and mark all of your points of interest, glassing points, bugle spots, they all automatically sync with your phone or tablet as well. I think this is an awesome product and a must have for hunters which is why I am super excited to have OnX as a sponsor of the shop. Use the Rich Outdoors Promo code TRO and save 20% on a membership. It truly is one of the best tools under $100 to make you a better hunter. We have a special guest today and a special topic. This is not your average podcast, and it may not be for everyone. One of the most common questions I get asked is “How do I get into the hunting industry?” Which is a great question! How do I get paid to do what I love? As an entrepreneur I love this conversation almost as much as talking about elk hunting. Last year at SHOT show I ran into @mattbusbice and we started talking about business. As a very successful entrepreneur I have a lot of respect for what he has built. Naturally I thought it would be a great guest to talk about how to get into the industry and build a career doing something you love. This episode may not be for everyone but for some this episode may just change your life. I think there is some solid advice throughout the episode and I can’t thank Matt enough for taking the time to share his story with us. Matt Busbice along with his brother and dad have built the american dream by taking one idea for a product and turning it into a very successful business. On top of that now turning it into multiple successful companies. Be sure to check out Matt’s newest shows by subscribing to My Outdoor Tv, you can use the promo could WGN for a free trial. This Episode is brought to you by goHUNT.com. goHUNT Insider is a must have for serious western hunters. goHUNT just launched their newest addition to Insider with the goHUNT Gear Shop. Unlike other stores the goHUNT Gear Shop is specifically hand picked, field tested gear for diehard hunters. This is not your average hunting retailer, in fact they only have high quality gear and brands that most hunting retailers don’t even carry. goHUNT has built in a rewards systems that gives you the best price on the product, plus points back to spend on future purchases. Signup of goHUNT/insider and use coupon code RICH to get $50 in points for to cash in at the new Gear Shop. This episode is brought to by Sportsman’s Box. Sportsman’s box is a monthly gear discovery box for hunters and anglers. Each month they bring you cool new gear, apparel, and even jerky or BBQ rubs . The box is focused on things hunters and anglers actually use and name brand gear too. Each month they send you between $65 and $80 dollars in gear and it only cost you between $35 and $39. That a ton of extra value! The Sportsman’s box makes a great gift too, its like the gift that keeps on giving every month. 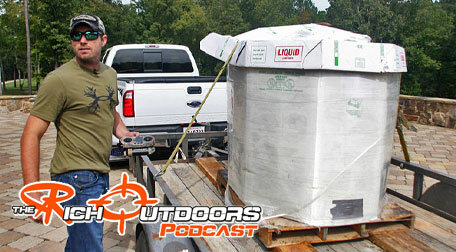 Signup for at www.sportsmansbox.com and get 20% with The Rich Outdoors Podcast code TRO and get 20% off.